Enjoy wine, cheese, and stunning scenery on your France river cruise on the Seine and Rhône Rivers. You’ll have a choice of historical excursions in Normandy, including the famed landing beaches, Point du Hoc monument, and the American Cemetery. Visit Joan of Arc’s Rouen, and choose from Claude Monet’s Giverny or Bizy Castle; Vincent Van Gogh’s Auvers-sur-Oise or Napoleon and Josephine’s Malmaison. Before you embark on the beautiful Seine River, you’ll spend time in Paris—one of the world’s most romantic cities! The “City of Lights” is home to Notre Dame Cathedral, the Eiffel Tower, and the Louvre Museum, and you can take a guided walk to see the Île St. Louis and ascend the Eiffel Tower. 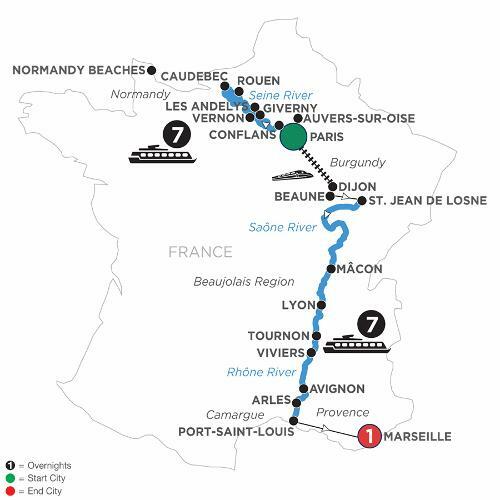 Taste some of Burgundy wines on board your ship, and visit the Chardonnay wine region. Cruise to France’s culinary capital of Lyon, and visit the Place des Terreaux fountain of famous postcards, then visit the Beaujolais region to taste famous wines. Beautifully nestled among vineyards, you’ll find the twin cities of Tournon and Tain l’Hermitage, where you’ll go on a guided walk of 16th-century sites in Tournon, followed by a wine and chocolate tasting. Cruise to historical Avignon and see the 14th-century Palace of the Popes and enjoy a wine tasting on a visit to the Châteauneuf du Pape wine country. Sail on the Rhône River to Arles, France—famous for inspiring the paintings of Van Gogh. In the second portion of your cruise a Master of Wine will travel with you and share lectures, tastings and food and wine pairing expertise. As a perfect finale to your Seine river cruise vacation, spend time in the captivating Marseille. Explore this elegant area and relax along the remarkably blue water of the Mediterranean Sea.